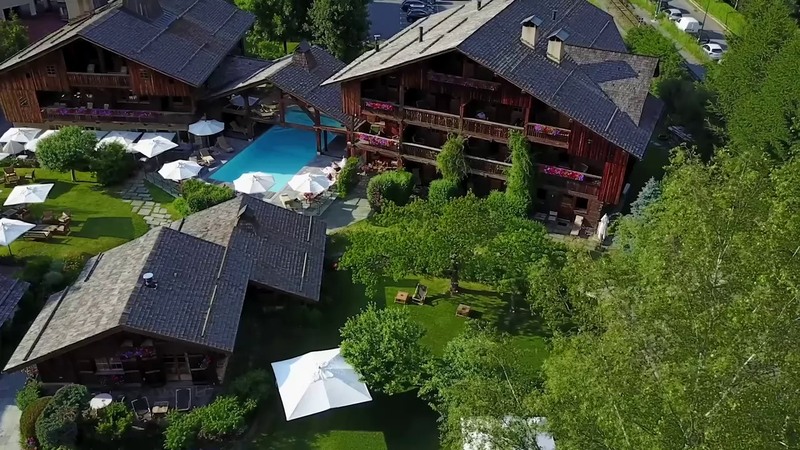 5-star, Relais & Chateaux, the Hameau Albert 1er proposes a luxurious haven of tranquillity in the very heart of Chamonix, where the Carrier-Maillet family has been dedicated to providing charm, prestige, gastronomy and warm welcome to the mountain since 1903. Luxury hotel rooms with character; family suites; cosy, independent chalets; indoor/outdoor swimming pool and spa, facing Mont-Blanc; gastronomic Michelin** restaurant; traditional restaurant and seminar rooms promise a fabulous stay in the world capital of mountaineering. We wish to inform you that some renovation works of the roof of our ‘ La Ferme ‘ building will be realized, from the 6th May 2019 and should be finished on the 22nd June 2019. 5* Relais & Chateaux, the Hameau Albert 1er is a small hamlet nestled in a picturesque garden with brook in the centre of Chamonix Mont Blanc. Luxurious hotel rooms, family suites and independent chalets that tell a story through time between past tradition and modernity. Taking the time to dine in Pierre Maillet’s two Michelin star restaurant truly is an epicurean journey of discovery and expression of taste. For five generations, gourmet cuisine is the result of a combination of alpine produce and delicate treasures. Come and discover the return of local cuisine from a bygone era in a meticulous, mountain setting. A culinary journey of Savoyard tradition that hails the cuisine of our grandmothers. The jazzy QuartzBar is a chic and cosy place to enjoy wines, cocktails and refined liqueurs. A unique ambience for an exceptional evening ! A hot stone massage, a dip in the Mont Blanc-facing pool, a moment of relaxation in the Jacuzzi... Le Bachal spa is a well-being paradise ! A new, modular seminar space of 90m², Le Fenil is an architecurally-designed, barn-inspired building, ideal for corporate events, meetings and team building. Pierre Carrier and Perrine Maillet offer you more than just a stay in a 5* hotel. You are about to enter a house that celebrates 115 years of history. They are respectively the 4th and 5th family generations to oversee the destiny of this establishment and through their presence, their attachment to the Chamonix valley and their personalities, they are able to breathe new life into the art of mountain living.